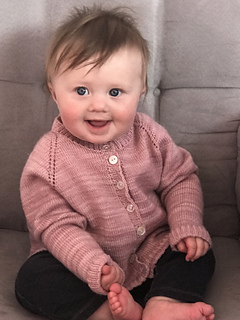 Knitted in the softest pink color, this seamless raglan cardigan is fit for a princess. It’s worked from the top down with yarnover increases along the four raglan lines. Sleeve stitches are then placed on holders while the body is worked to the hem. 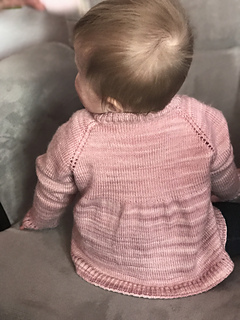 Stitches are increased across the back to create a feminine ruffle and a comfortable fit. The sleeves are worked in rounds to the cuffs. 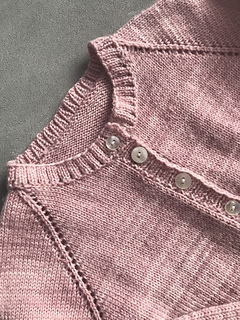 The lower body, cuff, and neckband edges are punctuated with eyelets and a simple rib pattern. Tiny shell buttons provide a sweet finishing touch. 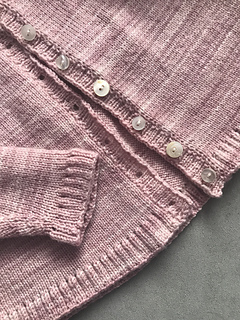 To prevent color pooling with the hand-dyed yarn, alternate 2 rows each from two skeins of yarn throughout the lower body once the sleeve stitches have been placed on holders; alternate 2 rounds each from two skeins of yarn when knitting the sleeves.